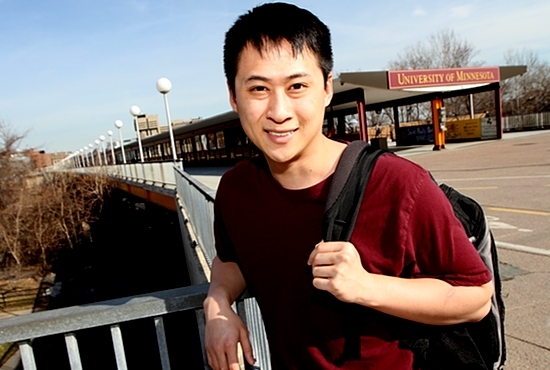 University of Minnesota law student Quang Trang looks forward to joining the Catholic Church at the Easter Vigil at St. Lawrence-Newman April 4. He was especially drawn to the Church because of the sacrament of reconciliation, which he says will help resolve anger he has had toward his brother. Quang Trang knew he needed to do something about his anger, especially a festering hate he felt toward his older brother. It is that problem that is leading him to join the Catholic Church. Quang, 23 and a first-year law student at the University of Minnesota, is a catechumen at St. Lawrence Catholic Church and Newman Center and will join the Church at the Easter Vigil April 4. Along with him are eight candidates (those who have been baptized in other denominations) and eight more who grew up Catholic but were never confirmed, for a total of 17 people completing their sacramental journey into the Church. He still feels the barrier because of the long-time anger he has felt toward his brother, Baochau. Two years younger, Trang said he developed a rivalry with his brother, who was not only older, but physically stronger and more athletic. 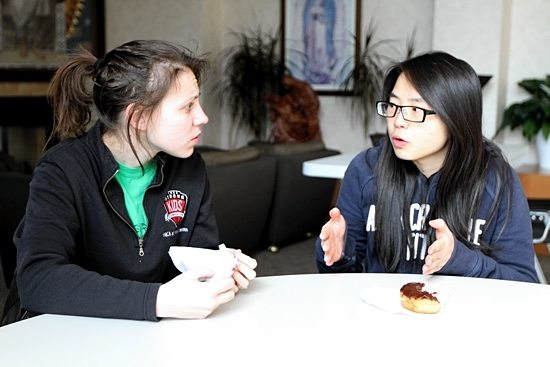 Cher Ling Tong, right, talks with her sponsor, Shawna Zielinski, at St. Lawrence-Newman. Tong will be confirmed at the Easter Vigil and complete her journey into the Church. After graduating from high school in his hometown of Naperville, Ill., Trang went to college at the University of Illinois, which is where his brother also was a student. Even though the two were on the same campus, they never spoke, Trang said. In fact, he was working out intensely in the gym awaiting the day his brother would provoke him yet again. This time, Trang resolved, he would be ready for the attack. But, he was not at all prepared for the bombshell Baochau would drop on him during a visit Trang’s sophomore year. “One day he called me up and he drove to my apartment,” said Trang, who was born in Vietnam and moved to the U.S. with his parents and brother when he was 1. “He took me out for lunch, and during lunch, he apologized: ‘I’ve been a bad big brother and I’m very sorry. I should have treated you better. I was the older one, I should have known better.’ At that point, I didn’t know what to say. That caught me completely off guard. In the meantime, Trang started going to Mass with his girlfriend, Bethany DiGiovanni, who is Catholic. A pivotal moment came at a Christmas Eve Mass not long after the meeting with his brother. During one of the hymns, he thought about his brother and recalled the good things he had done for him, like walking him home from school, trying to teach him sports and generally looking out for him. The floodgates began to open. Trang knows confession is the answer, and that is precisely why he is excited to join the Church. 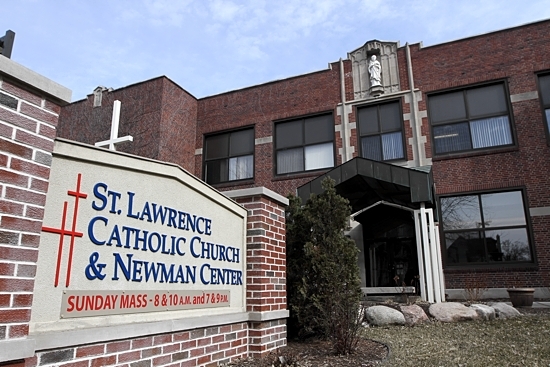 It’s one example of how a class of 21 RCIA students at St. Lawrence-Newman are discovering in the Church answers to their questions and problems. Someone who carefully scrutinized Church teachings to arrive at that conclusion is Shawna Zielinski, a catechumen last year and a sponsor this year for Cher Ling Tong, a 21-year-old biochemistry undergraduate student from Malaysia. In her younger years, Zielinski, 23, and a doctoral student in Hispanic linguistics, was more than skeptical about the Catholic Church. That was in high school. With no religious upbringing, she began dating someone she later discovered was a Christian. She saw his passion for his faith, and was drawn to it. Then, when she went to college at the U of M after graduating from high school in Sullivan, Wis., she started exploring more intensely. She looked at several Christian denominations before deciding on the Catholic Church. She joined a year ago during her senior year at the U. Now, her task is to help Tong in her journey into the Church. Tong became Catholic when she was 10, but was never confirmed. She is one of the eight who will receive this sacrament at the Easter Vigil. Four students in the RCIA class are still considering the Church, but not ready to join. Thomas Krumel is sponsoring one of them. He joined the Church a year ago in Iowa and is one of the older people in the RCIA class at 27. He started going to Mass while his mother was terminally ill with a lung disease. After she died in 2013, he was referred to a parish in Iowa not far from where he worked near the Iowa/Nebraska border. “There was this amazing priest there,” he said, and he ended up joining RCIA. Now, he wants to turn around and help someone else on their faith journey, even though the person he is sponsoring is not ready to join at this time. “I wanted to be a sponsor because I wanted to continue to grow in my relationship with Christ while I was here,” he said. Watching all 21 students in the RCIA class with delight is RCIA director Jane Rea, who is in her second year of running the program after being asked by the pastor of St. Lawrence-Newman, Father Jon Vander Ploeg. She’s even excited about having a non-Christian in the class. She thinks he was dared to join by some friends, but is slowly being drawn in. « Can a felon enter holy orders? Acceptable to chew the host?